Join the FineHomebuilding.com member community and get unlimited access to the entire site, including expert techniques, tool reviews, design inspiration, and much more. Already a paid member? Log in to access all member-only content. Your FineHomebuilding.com membership gives you access to a wealth of proven advice for builders serious about their craft. From job site videos that use real world materials, to tool reviews you can trust, it’s the essential resource for builders. Watch hundreds of tip and technique videos and unbiased tool reviews; plus, read in-depth articles on building science and craft, and access hundreds of tips and ideas you can use on the job. 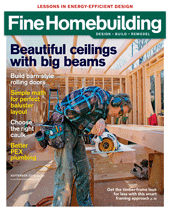 Get a one-year digital subscription to Fine Homebuilding magazine to read on your computer or mobile device. Read over 1,600 in-depth articles (even those out of print) so you can dig deeper on a huge range of topics. Get 1,700+ field-tested and editor-illustrated reader tips to save you time on projects large and small. Read and learn from the Builders Virtual Library – Complete books on key topics. FineHomebuilding.com membership is like having a builder mentor you can turn to with all of your building, remodeling, and design questions for less than $6 a month.